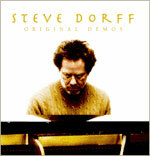 Steve Dorff "Original Demos" album (limited edition) feat. the late Warren Wiebe on vocals is now available online exclusiely at this website since October 1st. Whenever a song is recorded by an artist other than the songwriter, it is inevitably subjected to the influences of both the recording artist and the producer. Sometimes the original essence, and even the meaning, of a song is changed. "Songwriter Series" aims to share with you the original incarnations of these songs; the demos. Whether delicate or raw, richly orchestrated or bare-bones, the recordings here are true to the vision of their creators: the Songwriters.This Series open with one of the most highly regarded Songwriters of our day, Steve Dorff. Honored with an NSAI Songwriter of the Year award, 40 BMI and 11 Billboard #1 awards, three-time Grammy nominee, an Emmy nominee for five television compositions, and nine #1 film songs and 15 Top 10 hits, Steve Dorff has written music for such fine artists as Barbra Streisand, Celine Dion, Whitney Houston, George Strait, Vanessa Williams and countless others. Among these nine #1 film songs and 15 Top 10 hits: the Kenny Rogers' classic "Through The Years", a BMI 3 million performance song, as well as "I Just Fall In Love Again ", the Anne Murray record that captured Billboard's #1 Song Of The Year honors. Released in a limited numbered edition of only 1000 copies, this album of Steve Dorff includes 13 original Steve Dorff song demos, beautifully enhanced by the soulful, unforgettable voice of Warren Wiebe. David Foster's wife, Linda Thompson, is credited as co-writer of two of the songs, "A Little Thing Called Life", a ballad later re-recorded by Aaron Neville on the album "The Tattooed Heart", and "Everytime You Cross My Mind". Other co-writers include Billy Kirsch, Larry Herbstritt, Leslie Satcher, Kim Williams, Kent Blazy and Dorff's son Andrew. The album also features a wonderful remake of "I Just Fall In Love Again", the Anne Murray hit that reached a Billboard's #1, and two really outstanding songs, "The Echo Of Your Whisper" and "And Still Run Out Of Time", later produced by keyboardist Ricky Peterson on Donny Osmond's mini album "Four".